Lion coloration varies from light brown to yellowish, reddish, or yellowish-orange. Although cubs are born with brown rosettes, they fade as the cub matures. Males have manes and all lions have a tuft of fur at the end of their tail. They are the only cats that have fur at the end of their tail. 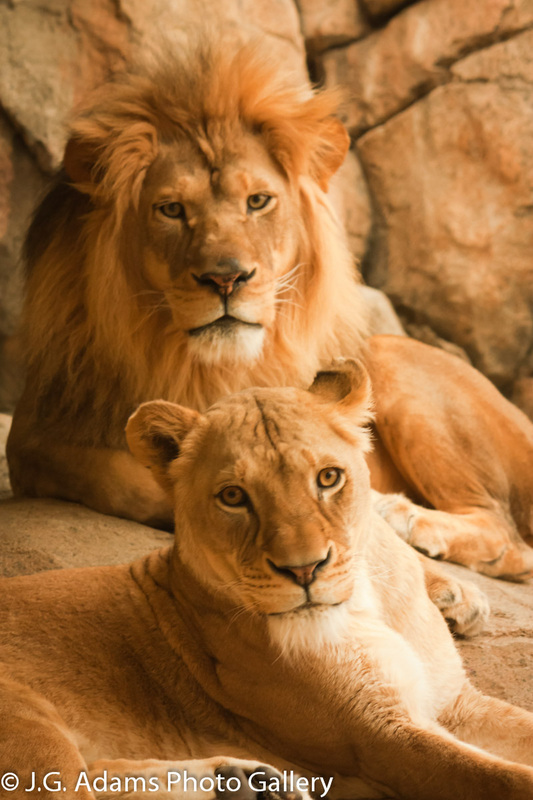 Lions are the only members of the cat family to display obvious sexual dimorphism (easy-to-see differences between males and females of a species). They are the tallest (at the shoulder) of all cats at around 4 feet being 2” taller than the tiger. Lions are also the second biggest cats, behind only the tiger, in weight and length. The average weight of a lion is between 300-500 lbs. with females being on the lower end and males on the higher. 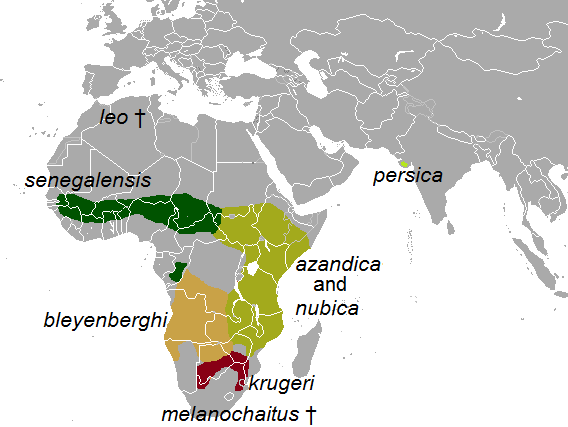 Savannahs or grasslands (occasionally bush or forest) of Sub-Saharan Africa or Asia. Lions spend much of their time resting and are active only about four hours every day. They are primarily nocturnal, though they border on the edge of being crepuscular. They are unusually social compared to other wild cats and live either in a pride or, occasionally, are known as nomads traveling alone or in pairs. A lion may switch between being part of a pride and being a nomad. A pride is usually centered around one male lion, occasionally two, and five or six female lions. However, prides consisting of up to thirty lions have been documented. Their prey consists mainly of large mammals, with a preference for wildebeest, zebras, buffalo, and warthogs in Africa and nilgai, wild boar, and several deer species in India. Every so often, they take smaller species such as Thomson's gazelle or springbok. Lions and spotted hyenas occupy the same ecological niche (and hence compete) where they coexist. Lionesses do most of the hunting for their pride. They are more effective hunters as they are smaller, faster, and have more dexterity than the males. The male lion or lions associated with the pride usually stays and watches the cubs while waiting for the lionesses to return from the hunt. Because they are sprinters, the female lions will stalk the prey until they are within about 100 feet of it. Lions do not usually hunt people, but some lions do seem to seek out humans. 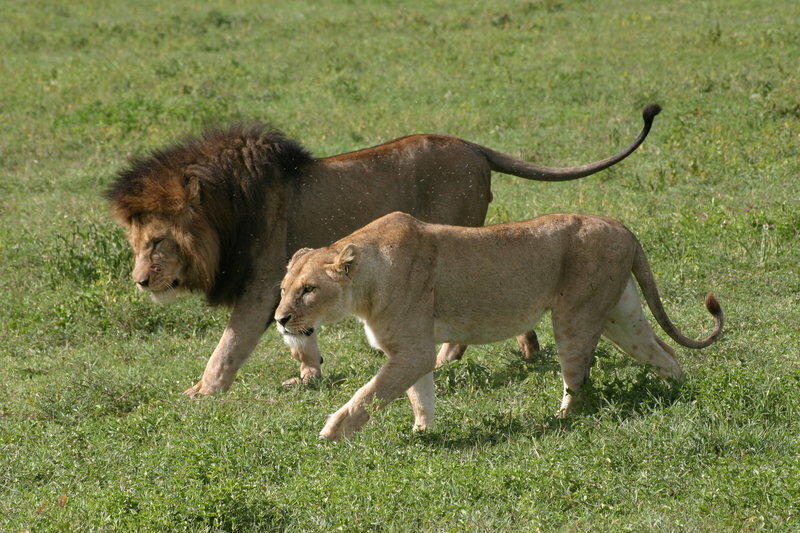 Lions do not mate at any specific time of year, and the females are polyestrous. The average gestation period is around 110 days. The female gives birth to a litter of one to four cubs in an isolated den (such as a thicket or a cave) usually away from the rest of the pride. The cubs are born blind and will stay that way for about a week. They weigh 2.6–4.6 lb at birth and are practically helpless. The lioness moves her cubs to a new den several times a month to prevent building up scent that would attract predators that would hurt the cubs. Usually, the mother does not introduce her cubs back into the pride until the cubs are six to eight weeks old. Weaning occurs after six to seven months. Male lions reach maturity at about 3 years of age and may challenge the male leader(s) of a pride at 4–5 years. With so many dangers, as much as 80% of the cubs will die before they are two years old. They live an average of 10-14 years in the wild, but can live more than 20 years in captivity. Although adult lions have no natural predators, most of them die from humans or other lions. Lions often seriously hurt each other, either in territorial disputes between prides, or members of the same pride fighting at a kill. Maimed lions and lion cubs may succumb to hyenas, leopards, or be trampled by buffalo or elephants. Lions may also be crippled when hunting. Asiatic lion (Panthera leo persica) Also known as the South Asian, Persian, or Indian lion, was once widespread from Turkey, across Southwest Asia, to India and Pakistan. However, men found them easy to poach. Now around 400 exist in and near the Gir Forest of India. Barbary lion (P. l. leo) Although now extinct in the wild since 1922 due to excessive hunting, the Barbary lion originally ranged from Morocco to Egypt. This was one of the largest of the lion subspecies. It seems to be more closely related to the Asiatic lions rather than sub-Saharan lions. A number of animals in captivity are likely to be Barbary lions. West African lion (P. l. senegalensis) The West African lion is found in western Africa, from Senegal to the Central African Republic. Congo lion (P. l. azandica) The Congo lion is found in the northeastern parts of the Congo. East African lion (P. l. nubica) Also known as the Masai lion or Tsavo lion, it is found in East Africa, from Ethiopia and Kenya to Tanzania and Mozambique. Southwest African lion (P. l. bleyenberghi) Also known as the Katanga lion, it is found in southwestern Africa, Namibia, Botswana, Angola, Democratic Republic of the Congo, Zambia, and Zimbabwe. Southeast African lion (P. l. krugeri) Also known as the southeast African or Transvaal lion, it is found in the Transvaal region of southeastern Africa, including Kruger National Park. White lions are a rare form of this subspecies. Cape lion (P. l. melanochaita) The Cape lion became extinct in the wild around 1860. DNA research does not support its status as a distinct subspecies. The Cape lion probably was only the southernmost population of the Southeast African lion. Popular hybrids are ligers, a cross between a male lion and a tigress, and a tiglon or tigon, a cross between a male tiger and a lioness. 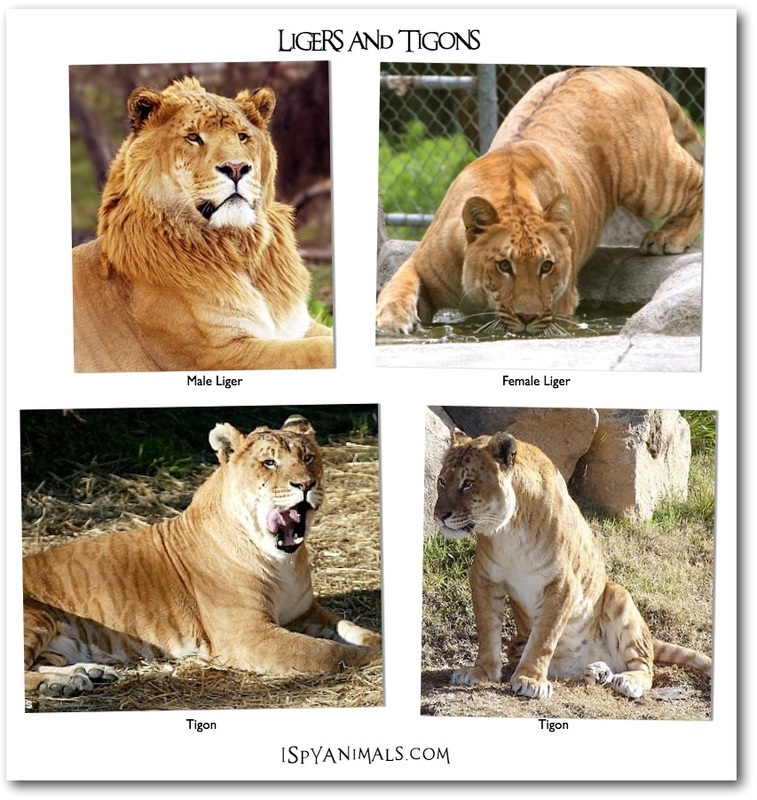 Ligers have a tiger-like striped pattern that is very faint upon a tawny lion-like background. If rosettes are inherited (lions carry genes for spots), they may be black, dark brown, or sandy. Ligers normally grow larger than either of its parents. Tigons can exhibit visible characteristics from both parents. They can have both spots from the mother and stripes from the father. They are often around 400 lbs. Lions also have been crossed with leopards to produce leopons, and jaguars to produce jaglions. The IUCN Red List classifies the lion as vulnerable. There are 16,500 to 25,000 lions in the wild. Habitat loss and conflicts with humans are considered the most significant threats to the species.